Nowadays there are many ways to create videos, and most people have access to devices that are capable of recording them in some fashion or other – whether it is a webcam, smartphone, or even digital camera. However making a great-looking video consists of more than just recording the raw footage, and if you want your video to look and feel professional then a lot of what makes it do so is going to be down to the tweaks and edits that you’re able to carry out. 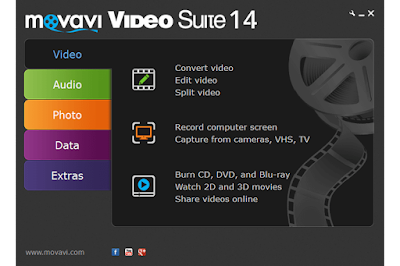 With the Movavi Video Suite, this doesn’t necessarily have to be difficult or complicated. It has all the features that are needed to polish a video to perfection, but what really makes it stand out is its user-friendly approach. Even if you have absolutely no experience editing videos and don’t know the first thing about the technical details that are involved in doing so, you’ll find that you’re able to pick up the software and put it to work due to how intuitive it is. Enhancing the quality of the video by adjusting its color settings as well as fixing issues such as shaky or blurry video, and even pixelated segments. Including transitions between scenes of the video to stylishly link them together and jazz it up a little bit. Cut videos into segments or join segments together to remove unwanted footage and create a ‘final cut’. Apply special effects and filters that will completely transform the style of your video in a variety of ways, including making it look like a ‘retro’ movie, creating a split-screen effect, and much more. Adding background music or voiceovers from audio files or by capturing it directly via a microphone. Inserting text to form captions, subtitles or even watermarks that can be customized and stylized in numerous ways. Using presets to optimize the video format and settings based on the device or platform you’re using. shaky or blurry video, and even pixelated segments. All that is really just the tip of the iceberg and there are tons of other features present in the Movavi Video Suite too. Suffice to say, if you want to make videos it will give you access to an extensive set of tools that will allow you to create a final product that looks and feels as though it was professionally produced in a studio.